WARNING: In The Wonder Weeks, full version, all ten leaps are described. This chapter book only describes the fourth leap. 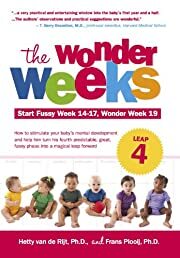 The Wonder Weeks, start fussy week 14-17, Wonder Week 19, Leap 4. How to stimulate your baby's mental development and help him turn this predictable, great, fussy phases into a magical leap forward, describes in easy-to-understand terms the incredible developmental changes that all babies go through 19 weeks after the due date (fussy period 14-17 weeks). The perceptual world your baby enters after the next leap is the world of “events.” Until your baby has made this leap, he can only perceive smooth transitions. After he has made this leap, he is able to perceive a short, familiar series of “smooth transitions” with all his senses – seeing, hearing, feeling, smelling, and tasting – and also when it comes to interactions with those around him. Examples include the perception of a bouncing ball, or grasping something with a hand. The baby will enjoy the classic nursery rhymes with gestures, such as "Itsy Bitsy Spider…"
Tip: If your baby is “fussy,” be sure to observe if he is mastering new skills already, or attempting to do so. Note: Most babies make this leap 19 weeks after the due date. However, some babies make the leap one week sooner, some one week later.